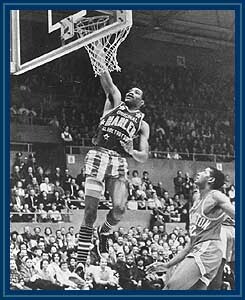 Connie Hawkins playing with the Harlem Globtrotters. Every June the annual summer basketball leagues begin from the biddies to the old-timers. Some of the premiere leagues also begin as the Greater New York Pro-Am League at Riverbank State Park in Manhattan and The Louis Armstrong (Elmcor) Gym in Queens, The Nike Pro League at Hunter College, and the Citywide League at all the five boroughs in New York City. The crowd packs it up in Harlem at the Rucker Playground. The Rucker Playground brings a special tradition for New York Basketball. The crowds are over packed to see the likes of Wilt Chamberlain, Connie Hawkins, Julius Erving, Kareem Abdul Jabaar and the playground greats of the game. The league at Rucker Park is now call the Entertainers Basketball Classic. This is the league where the celebrities come out to watch or play. Rap artist Sean "Puffy" Combs has a team in the league. It is called Bad Boy Entertainment, also Little Kim and Ceasar have a team in the league. A few of the NBA stars came out and played a.k.a. Vince Carter, Allen Iverson, Joe Smith, Kevin Garnett, Stephon Maubury, and Kobe Bryant. The current playground legends playing is Rafer "Skip To My Lou" Alston, James "Speedy" Williams, Malloy "The Future" Nesmith, Ron "The Terminator" Mathias, Half Man-Half Amazing, and The Main Event. If you going there to watch the action you need to get there early in order to get a seat; they do turn people away. The West 4th Street Summer League located in downtown Manhattan and it features some of the best ballers on the semi-pro level. The Sole In The Hole Classic in Bedford-Stuyvestant area in Brooklyn feature some the best local college and semi pro players. A documentary film was made of this tournament featuring the team Kenny Kings, Ed "Boger" Smith, and Charles Jones who led the NCAA in scoring back in 1997. Smith was on the cover of Sports Illustrated and had a story about him back in 1996. Earl "The Goat" Mannigult - Known as the greatest player who never played in the NBA. Had great leaping ability and school the likes of Wilt, Connie, and Kareem on the Rucker playgrounds. Rebound from heroin use and gave back to his community. A park and tournament is name after him on the lower Eastside in Manhattan. James "Fly" Williams - Can light it up on offense, drops 63 points on Moses Malone in the Dapper Dan Classic. Had a brief stint at Austin Peay State (TN). Richard "Pee Wee" Kirkland - Had fierce rivalries with Tiny Archibald. He rejected a contract that the Chicago Bulls offer him and said "Hey I could make more money in a couple of days on the street". Joe "The Destroyer" Hammond - Score 50 points in one half against Julius Erving in the Rucker Tournament. Lloyd "Sweet Pea" Daniels - He was a one man gang on his team. He can do it all score, rebound, and had a lot of versatility. Daniels had poor grades, which force him to attend four different schools in 3 years. Drop out of high school in 1986 got his GED. His arrest for drug possession prevents from playing at UNLV. After recovering from his gunshot wounds, he had a few brief stints in the NBA with San Antonio, LA Lakers, and Philadelphia. Rafer "Skip To My Lou" Alston - A flashy and quick point guard can make things happen. Played one year at Fresno State after transfering from the JUCO ranks and a backup point guard for the Milwaukee Bucks. Back in the 60's and 70's the Public School City Champion played against Catholic High School Champion for the ultimate city title at Madison Square Garden. It was the best thing tah was going on back in the days and the Garden was completely sold out. Due to riots and gang violence, the event had to be removed from the Garden and it ended the matchup between the PSAL and CHSAA championship teams. Anyway, the city championships for both leagues still carry on it's tradition. 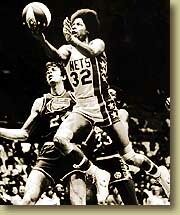 The PSAL play the city title at St. John's and Hunter in the late 70's and 80's. In the early 90's the Public High School city championship games were allow to return to play at Madison Square Garden. The Catholic High School continue to play at Fordham University in the Bronx. The winners of the CHSAA and PSAL titles compete in Glens Falls and play the New York State Public School champions and Private Schools. The New York State championships in 1979, the two city champions play each other a majority of the time. It is not the same upstate as it will be in New York City. It will always be a player's dream to win the city title over the state. Some of the city's great ball players got the opportunity to win a city title such as the likes of Tiny Archibald, Lew Alcindor, Kenny Anderson, Rod Strickland, Malik Sealy, Felipe Lopez, Stephon Maubury, Lamar Odom, Eric Barkley, Kenny Satterfield, and Ron Artest. Power Memorial and Tolentine won more than a city or state championship; they had experience of winning a National High School Championship. In 1967, Power was led by the great Lew Alcindor (Now Kareem Abdul Jabaar) and in 1988, Tolentine High in the Bronx was led by the late Malik Sealy. Sealy star at St. John's and played with Minnesota Timberwolves. Tolentine was also led by Adrian "Red" Autry who played for Syracuse and Brian Reese who was a standout at North Carolina. Some of the city championship teams finish in the top 25 such as Rice, Loughlin, St. Raymond's, Lincoln, Grady, and LaSalle. The AAU teams became a frontier for players to earn scholarships to college. It is a great opportunity to perform in front of the college coaches in the nation. Two of the top AAU teams are The Riverside Church Hawks and Gauchos. They travel across the nation and Europe to compete against other teams. The Riverside program is run by Ernie Lorch has produce the top talented players such as Walter Berry, Kenny Smith, Mark Jackson, Ron Artest and Elton Brand. Lou D'Almedia's Gauchos had the likes of Ed Pinkney, Chris Mullin,DeWayne "The Pearl" Washington,Kenny Anderson, Rod Strickland,Stephon Maubury, and Jamal Mashburn. They are other AAU teams that compete with Riverside and Gauchos is Brooklyn USA, Elmcor, Madison Square Broncos, and The New York Ravens. Holcomb Rucker - He made a big influence with the kids in the community. Influence them to be successful on the court as well as in life. Ernie Lorch - Founder of the Riverside Church Hawks Basketball program. Mr. Lorch has help and produced several of the best players in the city out of his program. He was like a father figure to his kids and know their lives in and out. Help his players go to the best colleges throughout the country and assist them with their personal lives. Not only he help his players, also the people who coach his program. He has help the likes of Alex Evans and Dermon Player who are assistant coaches under Mike Jarvis at St. John's. Lou D'Alemedia - Owner of the Gauchos who has been a father figre to his players. He has produced like his rival Ernie Lorch players to the best college programs in the country. Bob McCollugh - Director of the Each One/Teach One Program and the Rucker Pro League. Cal Ramsey - Director of Community Relations with the New York Knicks. Became a big supporter for the top leagues and tournaments in New York. Cecil Watkins - President, CEO The Pro-Am League. Started as a director for the Ray Felix Tournament in Queens which was an elite tournament in the 60's. A few of the top players in New York such as Connie Hawkins, Dean Meminger, Lenny Wilkens, Ron Rutledge, Mel "Killer" Davis and a few to name. He became the Founder for Elmcor Youth and Adult Activities in East Elmhurst. Start up the Greater New York Pro-Am League which is one of the elite Summer Leagues in New York. The top New York City players participate in the league: Chris Mullin, Anthony Mason, Mark Jackson, Felipe Lopez, Rod Strickland, and Ron Artest. The Pro-Am League is a nationwide base organization around the country such as Los Angeles, Chicago, Washington DC, and Houston. them as interchangeable parts. His style was an aggressive, switching, man-to-man defense and a fast-breaking, pass-oriented offense. Ed Roman, the center, was 6-foot-6. Layne and Al Roth were 6-3 guards, and Ed Warner and Irwin Dambrot were 6-4 forwards. In 1994, the entire college's 1949-50 team was inducted into the New York City Basketball Hall of Fame. Red Holtzman - Head Coach of the Knicks. Coach them to the 1970 and 1973 NBA Championships. The garden was rocking in the days of their glory years. Had a few of the greats of the game: Willis Reed, Walt Frazier, Deam Meminger, Phil Jackson, and Earl "The Pearl" Monroe. Tom Konchalski - HSBI. One of the top basketball experts around the nation. He goes out and scout the elite athletes in the country. Jack Curran - The all-time winningest coach in New York State. He has been coaching at Archbishop Molloy high school for over 40 years. He has won a few city titles and coach the likes of Kevin Joyce, Kenny Smith, Robert Werdann, Kenny Anderson, and their current future star Marlon Smith. Lou Carnesseca - Long time coach for St. John's and kept some of the local talent players in New York. St. John's made several appearances in the NCAA Tournament and the final four in 1985. Some of his players move on to the NBA such as the likes of Chris Mullin, Mark Jackson, Bill Wennington, Jayson Williams and etc. In 1991 Coach Carnesecca was elected into the Basketball Hall Of Fame. Jack Donahue - Coach at Power Memorial in the 60's which produce Lew Alcindor. Power became the city's dominant program. Also, was the head coach the Canadian National Team in the Olympics. New York City hoops is in a new millenium and the talent continues to grow stronger. The talent will always come and go. The tournaments throughout the year continue to expand around the city and it will still be excitement for all basketball junkies.